As per the 54th Edition of the record book which was launched at at London’s Trafalgar Square, it had listed the Nano as the world’s cheapest car. The car has also made it to the Guinness Book of World Records 2009. 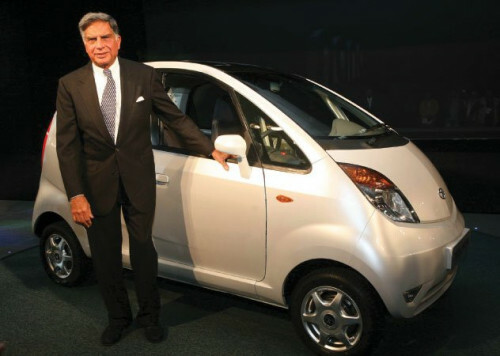 Referred as the “People’s Car” a dream Project of Mr Ratan Tata, the car costs almost half of the cheapest car available at that time in the market. So how a team of 500 Engineer’s manages to design the Worlds Cheapest Car. Below are some key interesting facts which made this possible. Taking advantage of India’s low production cost they minimized the components particularly steel to the maximum possibility. The Car has only 3 bolts in its wheel instead of 4 bolts. The Car has a single wiper instead of double. Tata Nano has fixed boot instead of movable. Standard Nano version did not had power steering. The car has much more space to offer in terms of legroom, shoulder room, elbow room, as well as head room, despite being smaller than the Maruti 800. The Car is fueled by lifting the bonnet; cost was saved by avoiding locks and lids. Despite being small in size, it has a good ground clearance 180mm which is more than some SUV’s and Hatchbacks in India making it suitable for all kind of roads. In order to keep the cost at 1lakh standard Nano had no AC, no power windows, no music system. Plastic with adhesives are used in various places instead of welding. Nano means ‘small’ in Gujarati, the mother tongue of Mr Ratan Tata but the name Nano is also inspired from the concept of Nano technology. No points in guessing that Tata Motors had applied for 34 patents for various innovations involved in the Car. Nearest expected competitor of Nano at that time was Bajaj’s RE60 which is yet to take birth in the car market. The Car’s making has also been featured as a documentary in Discovery Channel for its unique innovation. “Every Indian should be proud of Tata Nano as it’s an innovation by India”.